Safe Boating Week which falls in May might sound like a boring, bothersome event designed to limit our maritime enjoyment through government mandates that carry connotations of Big Brother. Nor is it intended to be the only time you practice safe boating. It just serves as a reminder to check the items that may need replacement or repair. Be sure to check the date of expiration on your VDS (visual distress signals). Check the gauge on your fire extinguisher. If it has no gauge, have it serviced and tagged. While checking your extinguisher, if it is chemical or dry powder, invert the container and give it a couple of good slaps on the side than shake it hard before you re-mount it. Check out the first-aid kit; make sure the tape and band-aids are still sticky. Check dates on salves and ointments, they expire just like pills. If you carry disposable rubber gloves, they can melt all over and make a mess if stored in a heated area. Coast Guard requirements for equipment aboard your boat address only a limited amount of safety equipment. Any boat that just meets the requirements is still unsafe. A review of the requirements is one of the boring activities I mentioned earlier so I will just advise a complete list may be obtained at any Coast Guard station or most marine outlets. Boating accidents and deaths fluctuate each year, dramatic drops one year may be followed by increases the next. Reasons for the variations are obvious, weather and the yo-yo economy. One statistic that does not vary is currently set at 90% of drowning victims not wearing a life jacket. This percentage has gone up year after year. Much of the safe boating media focus is therefore targeted at encouraging the use of lifejackets. PFD prices range from $ 5.00 to over $ 100.00. Each year new styles are introduced, tested and approved as manufacturers and the Coast Guard work together to develop the most comfortable – thus most likely to be worn, designs. The newest styles include inflatables, manual and automatic. Most carry a higher price tag with the least expensive inflatable belt packs at around $ 60.00 plus $ 10.00 for a rearming kit. If you select one, read all the information before purchasing and be aware they need proper care and maintenance. Inflatables are listed in various classifications from Type II to Type V. Some may only be counted as a PFD if worn while others qualify if readily available. With all the frequent testing plus additions and removals to the list, it would take another article to provide the breakdown. Just keep in mind the only way any lifejacket can save your life is if you’re wearing it, it’s in good condition; it fits properly and is properly fastened when you hit the water. How you maintain your boat is part of safe boating as well as how you equip and operate it. It’s a good idea to tally up your replacement parts to be certain you have that belt you may need for a quick repair and don’t forget to replace the duct tape you used up. Although not listed as a safety item, bow, hand, side and other rails should be maintained in the best possible condition. If they are loose, remove the fitting completely making certain you install plates or washers when re-installing for stronger backing. Fittings attached with only screws are not safe. When tightening a loose fitting, such as a rail base, inspect the base for cracks. Clean the deck area where the base mounts and use a good bedding material under each fitting. The use of good bedding keeps water from entering cracks or worn boltholes. If water collects in these areas it can freeze and expand during winter storage resulting in severe hull damage and a rail that could pullout or break if called upon to keep a person from going overboard. This type of maintenance should be considered safe boating practice. Another item to check is your lights and be sure to carry spare bulbs. Check all pumps, the wash-down and its fittings; bilge and water pump along with connecting hoses and clamps. Spare parts for these are a good idea to have aboard. A very important item to check is your horn, although not on the requirement list, horns will frequently fail during storage and need replacement. Another item not on the list of Coast Guard requirements is a VHF radio. If you boat on a small body of water with a small vessel, a radio may be of little use but no matter what size your boat is, if you venture onto large bodies of water, a VHF with a good antenna should be a must. The Coast Guard also does not require an anchor be carried on your boat yet it is essential for all size vessels. It is very important in protecting your safety because if your engine fails while running alongside a rocky reef on a windy day, you need it to prevent a very harrowing experience. I tested one extensively the “Hydrobubble (tm)” and found it works well in all types of bottoms, sand, mud, grass and rocks yet is easily retrieved. Most recent information I have gathered on this anchor is it is out of production but available at many distribution sites. Type the name into your browser and conduct a search – it will be well worth your effort. 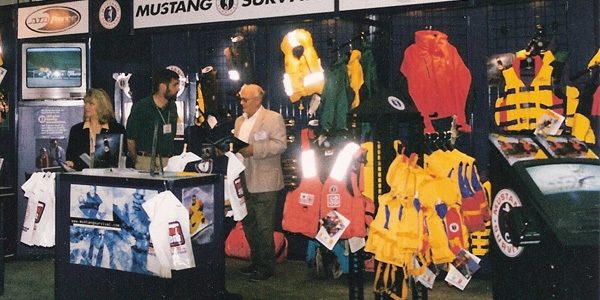 New safety items are introduced each year at various boat shows nationwide. I came across several of note. 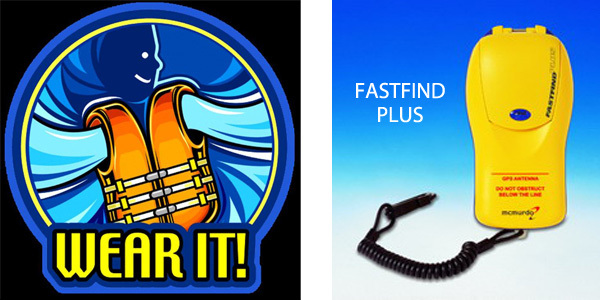 The 406 MHz GPS Personal Locater, called “Fastfind Plus” operates on the 121.5 MHz frequencies. It gives an instant alert and a GPS position to assist with a quick rescue when needed, a great device for those who venture offshore on large bodies of water. This item may be reviewed on the net by typing in the name. Another interesting item that would be useful on larger vessels and particularly sailboats is “MOB i-lert.” It constantly monitors crew and passengers and immediately raises an alarm if a person falls overboard. Price ranges from $ 500 to $ 3,000. Important for boating safety is to not only know what is required to properly equip your boat but to obtain the training to properly operate your boat. The Coast Guard Auxiliary and US Power Squadron conduct classes in every part of the country. Your local Coast Guard station can put you in touch with a local flotilla or class. If there are no classes available, Boat US and ABC (America’s Boating Course) have online classes (www.BoatU.S. Foundation General Boating Course and www.AmericasBoatingCourse.com). they provide a test and grading system upon completion. The online classes do not replace the experience that a seasoned instructor offers. They’re hands-on, been there, done that tales best describe what you may encounter. Cleaning, maintaining, replacing items all equal safety. Let’s all do what’s required and what we have learned is required to make this a safe boating season.